Everyone else seems to be making a topic, so I guess I'll add one too. I have an idea for the land contest already. I plan on writing it in ICE, but might try it in C if it's too slow to play or if some features of C seem necessary. My game will be a Taxi Simulator. You have to drive around and transport people for points until you crash. Traffic will show up as red on the map and be somewhat avoidable, but have a possibility of changing quickly. People looking for a ride will show up as circles on the road connected by a line to a destination marked with an X. You can carry 2 people and must pick up a person as you drive by if you have space. The trick will be to pick up passengers that lead you towards other people to pick up. Traffic conditions will change quicker as the game goes on. Looks cool. if the roads were a little bigger than it would make the game a lot easier because turning is going to be a problem... Can't wait till it's done because I can tell it's going to be great!!! Well, perhaps slow down the cars! The taxi will move relatively slowly on the map. It means I can get away with a lower frame rate without people noticing. If the game is extremely hard because of the limited resolution, I might add a zoomed in view on the right hand side showing all four sides of the intersection you are approaching. I also want the two challenges in the game to require similar amounts of attention at all times: picking a route with relatively little traffic without going out of your way or picking up an unwanted passenger, which gives points, and avoiding crashes in the short term, which stops points from being reset. This is similar to how actual driving works, where you have to divide your attention between the tasks of navigation and safety. You shouldn't be crashing so often that you don't have time to transport people. Traffic should ideally be slower yet more dangerous than driving on traffic-free roads, and making constant turns will also be more dangerous than going straight as often as possible. This means that players will have to plan their routes to keep up safety, without diverting too much attention from the road. I don't want the player's attention to be focused on just one of these tasks, so the taxi will move slowly enough for the games to last a while and require planning. 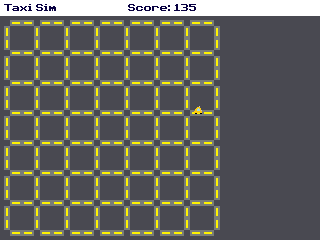 I added the taxi sprite and implemented movement and collision detection. Speed control - 20 pixels per second? I might have to make the taxi a bit bigger so that it's more visible. 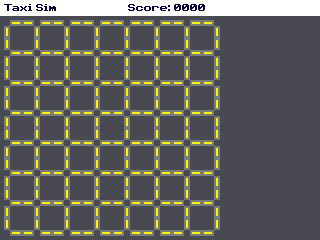 It is somewhat hard to see in this screenshot because it is stationary against yellow stripes, but it is easier to see while moving. 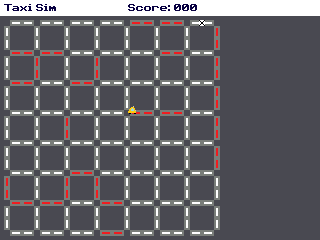 This might take a bit more work but maybe you could have a tilemap so that you can see only 1 street at a time and then have this map on the top right corner with a map that shows a green dot representing where you are and a red dot representing where you need to go. I think it would be a lot easier and way cooler... It's up to you though. Perhaps make the stripes white and the taxi yellow? I might have the color of the road change with the amount of traffic, so the stripes are red where there is traffic and green (or white) with no traffic. It is a bit unrealistic to see traffic conditions everywhere at once, but the map could be explained as a heads-up display showing traffic conditions and passengers that hailed a taxi using an app, and the view on the right could be the actual view of the road. I have an idea that would work for either Water or Air. Rather than a game, I would make a utility that lets you select two points on a globe and visually see the shortest "great circle" route between them. I don't really know how to display a rotatable globe. I could include a flat image of the Earth and an dictionary of points on the screen to points on an image of Earth. For example, pixel 0,0 (the middle of the globe) would correspond to an offset of 0°,0°; 0,64 (the top of the globe) would be 0°,90°. The image would be stored as a 360*180 image, and to find a pixel for a screen coordinate, the degrees of rotation and the degrees of offset would be added together, and the result will be the coordinates of the pixel in the image. This would probably cause distortions at the edges of the globe as pixels are not averaged together. If anyone has any better ideas, I would love to hear them. I don't have a lot of experience with rendering anything besides flat sprites. I had to take a break for a few days, but today I added traffic and a passenger system. The score also works correctly. I need a new sprite for the passengers, and I also need to limit the game speed as it currently runs too fast. I also need a main menu and a crash screen. I might also want to make some building sprites to add in between roads. I decided to make it so that traffic only slows you down, and you don't have to worry about speeding up or slowing down. I also have a plan for my Water entry, although it might not be possible in time for the contest deadline. I would have to include a black-and-white image editor that supported things like lines, arcs, and floodfill, or use an external program on the PC that converted images into appvars. The program would take an image as an input. It would simulate buoyancy, so you could draw a boat and see how much weight it could hold before it is completely submerged. To simplify things, I might put a size limit on boats and make it impossible for ships to tip over, as I would otherwise have to calculate fluids shifting as the boat turns. Unfortunately, I was away from home most of the two weeks, and had to work on it through Chrome Remote Desktop, which isn't much fun. I wasn't able to implement all the features I wanted to. Currently, you can only use one boat, which is an anchor, and you can't design your own. I have a buggy program that converts PNGs to AppVars on Windows, which I did not include as the AppVars fail to load. Also, you cannot add cargo to the boat. You can, however, change how dense the metal for the boat is, and how dense the water is. I hope to upload an updated version that implements these features, after the contest ends. I did find time to make my next winter-themed contest entry, Snowman Generator! Take some time to admire that amazing top hat and mustache! Unfortunately, I won't be submitting a Air entry. I have been out of town for a few days and I won't have enough time to finish, as I will be busy for a week or two. My original idea also proved difficult to implement, so I ended up scrapping it. © Copyright 2000-2019 Cemetech & Christopher Mitchell :: Page Execution Time: 0.206035 seconds.